Voting helps determine the future of our cities, counties, state, and nation. As the Texas Secretary of State, I am the state’s chief election officer charged with ensuring all eligible Texans know what they need to do to cast their ballots. My office has undertaken a statewide voter education campaign engaging voters and working to ensure that all qualified voters in Texas understand what they need to bring to the polls in order to vote in ongoing and upcoming elections. With the exception of the U.S. citizenship certificate, the approved photo ID must be current or have expired no more than four years before being presented for voter qualification at the polling place. If the voter has continued access to their acceptable form of photo ID, but, for example, forgets to bring it to the polling place and/or leaves it, for example, at home or in their car, the voter still possesses the acceptable form of photo ID and must use it to vote. If the voter does not possess and cannot reasonably obtain one of the seven forms of approved photo ID, the voter has additional options when casting their ballot in person. As provided by court order, if a voter does not possess and is not reasonably able to obtain one of the seven forms of approved photo ID, the voter may vote by (1) signing a declaration at the polls explaining why the voter is reasonably unable to obtain one of the seven forms of approved photo ID, and (2) providing one of various forms of supporting documentation. A voter whose photo identification has been lost, stolen, suspended, revoked or expired more than four years does not possess one of the acceptable forms of photo ID, and, if the voter cannot reasonably obtain a replacement of the identification that was lost, stolen, suspended, revoked or expired or another form of acceptable photo ID, the voter is eligible to present a supporting form of identification, execute a Reasonable Impediment Declaration, and, assuming they otherwise qualify, vote a regular ballot. Supporting documentation can be a certified birth certificate (must be an original), a valid voter registration certificate, a copy or original of one of the following: current utility bill, bank statement, government check, or paycheck, or other government document that shows the voter’s name and an address. Government documents that include a photo must be original and cannot be copies. If a voter meets these requirements and is otherwise eligible to vote, the voter will be able to cast a regular ballot in the election. Voters with a disability may continue to apply with the county registrar for a permanent exemption to showing approved photo ID (which now may be expired no more than four years) at the polls. 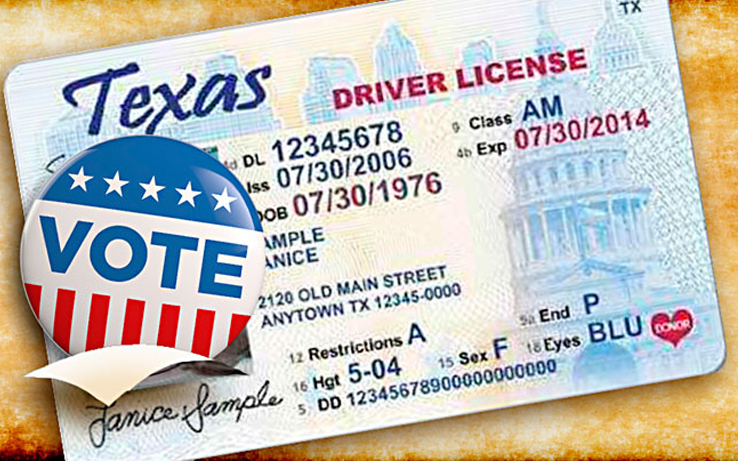 Also, voters who (1) have a consistent religious objections to being photographed or (2) do not present one of the seven forms of approved photo ID because of certain natural disasters as declared by the President of the United States or the Texas Governor, may continue apply for a temporary exemption to showing approved photo ID at the polls. In addition, voters age 65 or older, those with a disability, or those who will be out of the county during both early voting and Election Day may vote by mail. The deadline to request a ballot by mail is Oct. 28. The General Election is Nov. 8. Early voting runs from Oct. 24 to Nov. 4. The last day to register for the election is Oct. 11. I am currently traveling throughout Texas to talk as part of a non-partisan, bilingual voter education campaign called Vote Texas. This campaign seeks to ensure all voters in all communities understand when, where, and how to vote. Vote Texas is reaching, among others, voters in urban and rural communities, senior citizens, first time voters, military members, and minority groups. My team and I are committed to reaching the voters of our great state. For more information regarding voting requirements and voter ID, please visit VoteTexas.gov or call 1-800-252-VOTE.